With your traditional ways and civic sophistication. To another time, to every place. Have struck my soul as an architect. Of Tiber’s murmurs or Terra’s groans. Roots eternally my growing home. Editor’s Note: Here are three pieces written by Nick Harper on a travel course to Italy that Matt Panciera and I led in January. Nick is a Political Science Major and Classics and Philosophy Minor. He recently did an independent study on the intersection between myth and politics; his senior research paper will focus on effects of political mythology on American democratic culture. The coursework included daily written responses; it was great to see the individual interests of the students reflected in their writing. 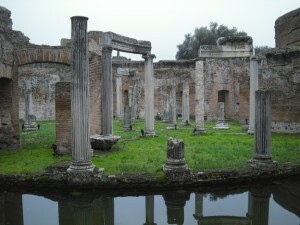 The delineation of spaces was important to the Roman culture. The physical definition of special boundaries aided in understanding and empowering the meaning of each space. 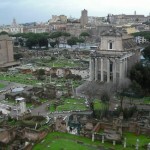 One example of the preservation of a delineated space is the Black Stone in the Roman Forum. Because the space was important, the Romans emphasized the rock’s boundaries rather than build over it. The delineation of this space displayed its power. A clear example of spatial definition in relation to religious power and sacredness is the concept of the templum. The enclosure of a temple as a building, especially the cella, creates a strong sense of divine power. Templum, however, originally referred to the area of the sky that augurs looked to for signs from the gods. The designation of this area of the sky gave it sacred significance. An additional example of the Roman cultural acknowledgement of important boundaries is the god Janus. Janus was utilized to emphasize boundaries, such as at the Fabricius Bridge and at the Arch of Janus over the Cloaca Maxima. To dedicate a divinity to the concept emphasizes its importance to the Roman people. The personification of delineated space attests to the Roman cognizance of its importance. Hadrian also understood this concept of delineation. He specifically emphasizes it in a mythic manner in his Maritime Theatre. He built a circle of water around the central island to represent the river surrounding the earth. This delineation of space created a symbolic microcosm for Hadrian that emphasized his power as emperor and added significance and meaning to his private quarters. Another way the Romans recognized the importance of delineated spaces was the requirement of dead bodies to be buried outside of the city walls. This prerequisite was mainly for pollution reduction, but there was also clearly an element of spirituality to it. The dead needed to be separate from the area of the living. The Christians would later echo this concept with crypts and cemeteries, seen as with the Protestant cemetery. A final example of spatial delineation is the contradas of Siena. Separate distinctions of districts emphasized local cohesion of citizens. It also characterized the towns as a whole. Thus, this physical definition provided a special social component to the city of Siena. The delineation of space, then, provided historical, religious, mythic, cultural, and social significance for the Roman people. Studying Roman architecture and culture has given me insight into the use of space to create social cohesion. Two obvious examples are the city-wide shared spaces of forums and basilicas. The everyday use of these spaces for business and casual use, as well as a setting for political discourse, speaks to why the forum and basilica were so important to the existence of Roman culture as we know it today. 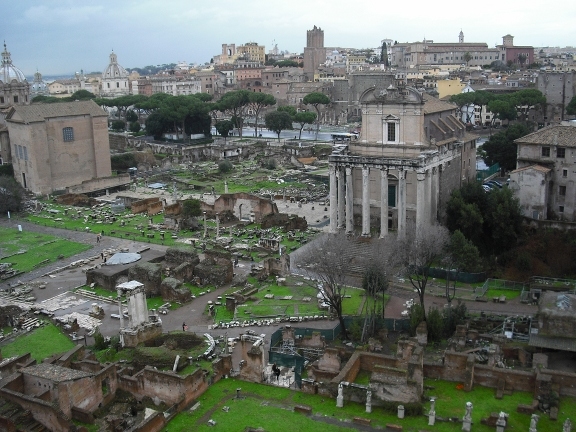 Without the forum or basilica, what would the Roman State have been? Not the political power it became, which only existed from its social cohesion that was fed by public space. Baths are another more social and intimate setting that also aided the social cohesion of the Roman people, even between classes since most everyone could use them and they were very affordable. 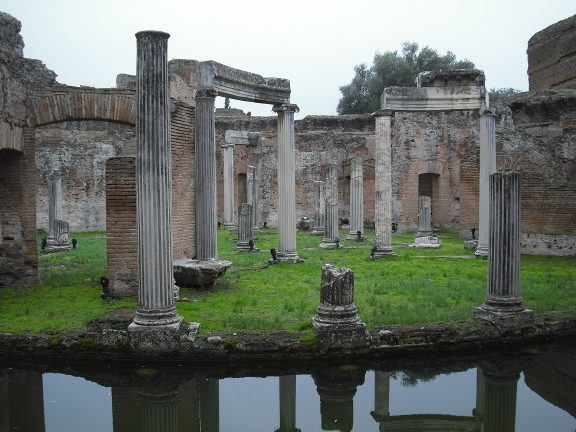 One act that epitomizes the idea of public space creating social cohesion was the return of the land to the people after the drainage of Nero’s lake and the construction of the Flavian Theatre. Even though the seats were stratified, the whole public enjoyed watching the games and fights and displays that took place. The “gift” to the people aided in social bonding and cohesion. A second political movement that represents the public space/social cohesion was the inclusivist reign of Hadrian. As we learned, Hadrian felt that the empire was a part of the greater commonwealth and gave attention to far reaches of the empire in addition to the area surrounding Rome. In this way, Hadrian used the space of the Roman Empire to create a social cohesion that he envisioned might create a greater, more peaceful Rome. The guild space sponsored by Eumachia in Pompeii also exemplifies the use of space for social cohesion. By giving the fullers a dedicated space, their merchant guild was given a place to gather and hold business. As merchants, it surely aided their economic strength and political influence, but it must have certainly also increased social cohesion by default of the previous two. A later and more modern example of space cohesion is the collection of contradas in Siena. By delineating areas of the city and giving each space a mascot, the contradas have fostered community growth, that which can still be seen today in contrada banquets and gatherings. One might suggest that the high level of bonding within each contrada causes less social cohesion between them. The contrada social circles are bridged, however, by the greater founding story of Siena and the public Campo. My final example of space and social cohesion is the set of catacombs used by Christians. Early Christians used the catacombs as a place of burial primarily. They also, however, did worship in the catacombs as well. This may have given them a small sense of refuge and morale boost. Having a place dedicated to Christians surely empowered them as a social group and aided in their interpersonal relationships and religious bonding.